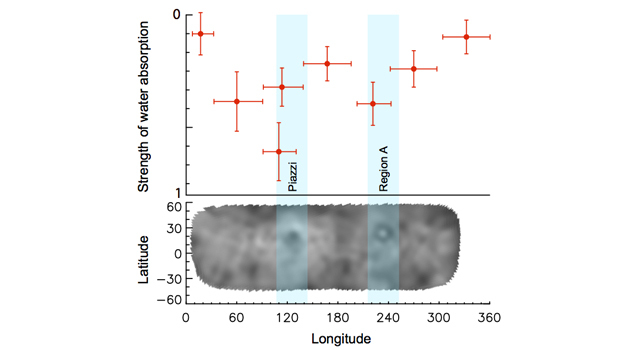 "This is the first time water vapor has been unequivocally detected on Ceres or any other object in the asteroid belt and provides proof that Ceres has an icy surface and an atmosphere," said Michael Küppers of ESA in Spain, lead author of a paper in the journal Nature. The results come at the right time for NASA's Dawn mission, which is on its way to Ceres now after spending more than a year orbiting the large asteroid Vesta. Dawn is scheduled to arrive at Ceres in the spring of 2015, where it will take the closest look ever at its surface. "We've got a spacecraft on the way to Ceres, so we don't have to wait long before getting more context on this intriguing result, right from the source itself," said Carol Raymond, the deputy principal investigator for Dawn at NASA's Jet Propulsion Laboratory in Pasadena, Calif. "Dawn will map the geology and chemistry of the surface in high resolution, revealing the processes that drive the outgassing activity." 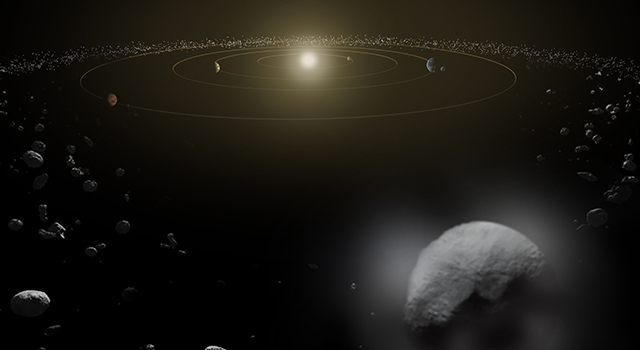 For the last century, Ceres was known as the largest asteroid in our solar system. But in 2006, the International Astronomical Union, the governing organization responsible for naming planetary objects, reclassified Ceres as a dwarf planet because of its large size. It is roughly 590 miles (950 kilometers) in diameter. When it first was spotted in 1801, astronomers thought it was a planet orbiting between Mars and Jupiter. Later, other cosmic bodies with similar orbits were found, marking the discovery of our solar system's main belt of asteroids. Scientists believe Ceres contains rock in its interior with a thick mantle of ice that, if melted, would amount to more fresh water than is present on all of Earth. The materials making up Ceres likely date from the first few million years of our solar system's existence and accumulated before the planets formed. Until now, ice had been theorized to exist on Ceres but had not been detected conclusively. It took Herschel's far-infrared vision to see, finally, a clear spectral signature of the water vapor. But Herschel did not see water vapor every time it looked. While the telescope spied water vapor four different times, on one occasion there was no signature. The strength of the signal also varied over hours, weeks and months, because of the water vapor plumes rotating in and out of Herschel's views as the object spun on its axis. This enabled the scientists to localize the source of water to two darker spots on the surface of Ceres, previously seen by NASA's Hubble Space Telescope and ground-based telescopes. The dark spots might be more likely to outgas because dark material warms faster than light material. When the Dawn spacecraft arrives at Ceres, it will be able to investigate these features. "The lines are becoming more and more blurred between comets and asteroids," said Seungwon Lee of JPL, who helped with the water vapor models along with Paul von Allmen, also of JPL. "We knew before about main belt asteroids that show comet-like activity, but this is the first detection of water vapor in an asteroid-like object." The research is part of the Measurements of 11 Asteroids and Comets Using Herschel (MACH-11) program, which used Herschel to look at small bodies that have been or will be visited by spacecraft, including the targets of NASA's previous Deep Impact mission and upcoming Origins Spectral Interpretation Resource Identification Security Regolith Explorer (OSIRIS-Rex). Laurence O' Rourke of the European Space Agency is the principal investigator of the MACH-11 program. Herschel is a European Space Agency mission, with science instruments provided by consortia of European institutes and with important participation by NASA. 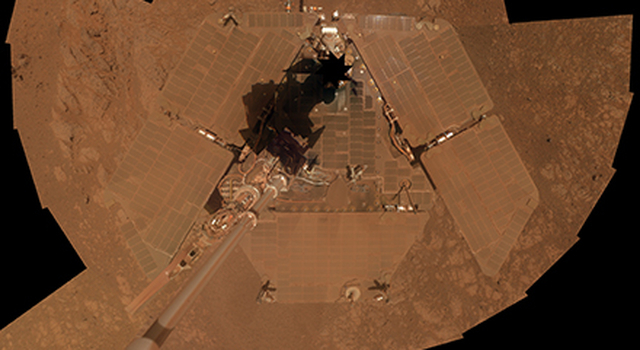 While the observatory stopped making science observations in April 2013, after running out of liquid coolant, as expected, scientists continue to analyze its data. NASA's Herschel Project Office is based at JPL. JPL contributed mission-enabling technology for two of Herschel's three science instruments. The NASA Herschel Science Center, part of the Infrared Processing and Analysis Center at the California Institute of Technology in Pasadena, supports the U.S. astronomical community. Dawn's mission is managed by JPL for NASA's Science Mission Directorate in Washington. 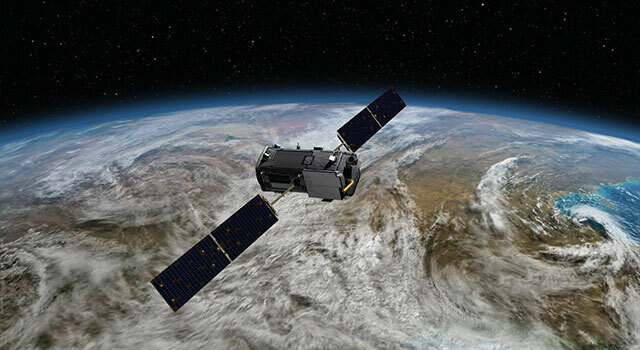 Dawn is a project of the directorate's Discovery Program, managed by NASA's Marshall Space Flight Center in Huntsville, Ala. UCLA is responsible for overall Dawn mission science. Orbital Sciences Corp. in Dulles, Va., designed and built the spacecraft. The German Aerospace Center, the Max Planck Institute for Solar System Research, the Italian Space Agency and the Italian National Astrophysical Institute are international partners on the mission team. Caltech manages JPL for NASA. More information about Herschel is online at: http://www.esa.int/SPECIALS/herschel. More information about NASA's role in Herschel is available at: http://www.nasa.gov/herschel. For more information about NASA's Dawn mission, visit: http://www.nasa.gov/dawn.